Makes 20 servings, 2 topped crackers (34 g) each. 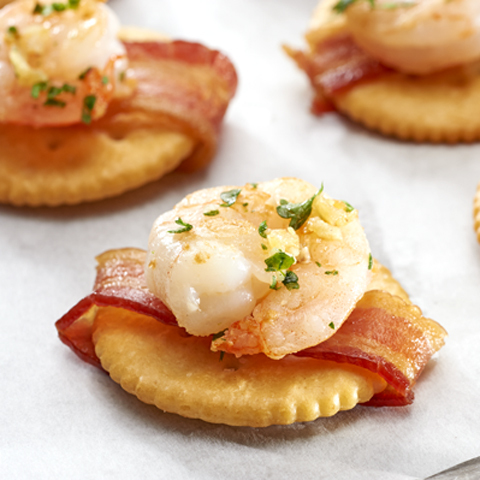 Wrap each cracker with bacon piece; place, seam side down, on parchment-covered rimmed baking sheet. Bake 5 to 6 min. or until bacon is crisp. Meanwhile, melt butter in large skillet on medium heat. Add shrimp; cook 2 min. Turn shrimp. Add garlic to skillet; cook and stir 1 min. or until shrimp turn pink. Remove skillet from heat. Stir in parsley. Spice it UpAdd 1/4 tsp. crushed red pepper to partially cooked shrimp in skillet along with the garlic.